DONAIRE STEPPING UP Floyd Mayweather Jr v Manny Pacquiao. 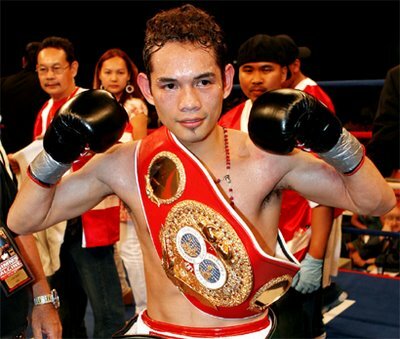 Filipino star Nonito Donaire will bid to win a world title at a fourth different weight in February. The 'Filipino Flash' will step up to super-bantamweight to fight Wilfredo Vazquez Jr for the vacant WBO title. Donaire has risen up most pundits' pound-for-pound ratings in recent times. Having destroyed Fernando Montiel in two rounds in February, his most recent win came against Omar Andres Narvaez in October when he defended his WBO and WBC bantamweight titles. The 29-year-old, who previously held world titles at flyweight and super-flyweight, and will now meet Vazquez, a former holder of the WBO super-bantam crown. The Puerto Rican lost the belt to Jorge Arce in May but bounced back with a third-round stoppage of Roberto Leyva in October. On the same bill, which will take place in San Antonio, Texas, on February 4, Mexico's Julio Cesar Chavez Jr will defend his WBC middleweight belt against Marco Antonio Rubio.